Piezo Ceramics as "Smart Materials"
The development of adaptive systems is increasing in significance for modern industry. Intelligent materials, so-called "Smart Materials", which possess both sensor and actuator characteristics, are becoming more and more important. They detect changed environmental conditions such as impact, pressure or bending loads and react to them. Piezo ceramics belong to this group of adaptive materials. 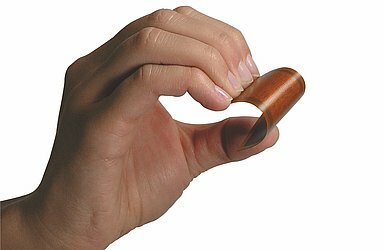 For some time now, piezo actuators have been used for monitoring and damping high-frequency oscillations. A compact solution is provided by piezoelectric DuraAct patch transducers: They are based on a thin piezoceramic film which is covered with electrically conducting material to make the electrical contact and subsequently embedded in a ductile polymer composite. The normally brittle piezoceramic element is thus mechanically preloaded and electrically insulated and is then so robust that it can even be applied to curved surfaces with bending radii of only a few millimeters. The transducers are simply glued to the corresponding substrate or already integrated into a structure during manufacture, where they detect or generate vibrations or contour deformations in the component itself. The extent of the contour change is strongly dependent on the substrate properties and ranges from the nanometer up into the millimeter range. Even when subjected to dynamic stress, this design ensures high damage tolerance, reliability and a lifetime of more than 109 cycles. They have low susceptibility to wear and defects because the transducers are solid-state actuators, i.e. they do not contain any moving parts.